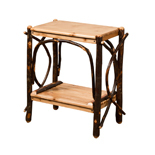 This handmade end table will shout loud and clear that you love twig furniture, using curvy twigs as a purposeful stylistic feature contrasting the straight and sturdy frame. It's a wood lover's dream. Not only does this handcrafted shelf mix the colors of different wood types but it has uniquely bent twigs on the ends. This Amish made end table is more than an heirloom. It's luxurious, sophisticated, contemporary and rustic all at once. This handcrafted antler end table has a solid wood frame just like any Amish piece. The glass top shows off the craftsmanship required to carve each deer antler shape and to put the base together to create one beautiful table. This American-made table will add beauty, luxury and pride to any rustic or contemporary living room or hallway. The Artesa Glass Coffee Table with Shelf uses angles in design to brighten a living room. The table's open scheme lets light through, as does the glass top. The glass is also beveled to reflect light in different directions. Even the wood table edge has a long bevel. The Artesa's legs fan toward the bottom and between the table ends are arches. A shelf adds function. Whether contemporary or modern, the Artesa table makes a room luxurious. The Artesa Open Coffee Table with Drawer and Shelf is both contemporary and practical. The beveled edge and fan legs make this table all about angles, while the open shelf lets light shine through. Arches support the ends of the shelf which is recessed slightly. A drawer is even more functional. This heirloom table is built to last in a stylish home. The Artesa Open Coffee Table with Shelf is full of angles for the contemporary design lover. The top has a distinctive beveled edge while the legs are fanned. The shelf is slightly recessed between its side supports and between the legs are side arches. This is where Amish quality meets contemporary furniture. The Artesa Amish end table with drawer and shelf has a distinctly beveled edge on top and angular fanned legs. On each side an arch helps support the legs and open shelf with thumbnail recess. The Artesa small wooden end table is an heirloom piece with contemporary design. The Artesa Open End Table with Shelf has so many stylish angles. The beveled edge, arched trestles, fanned legs, and thumbnail shelf are contemporary yet elegant. The arts and crafts end table is pictured here in cherry with Michael's Cherry stain. The base of this 26 inch coffee table is shown in brown maple with FC11047 Ebony stain, and top shown in elm with Michael's Cherry stain. The Avion Occasional handmade coffee tables are shown here with a custom two tone finish. Custom finishes need to be ordered by phone. The base of this solid wood coffee table is shown in brown maple with FC11047 Ebony stain, and top shown in elm with Michael's Cherry stain. The Avion Occasional tables are shown here with a custom two tone finish. Custom finishes on these 48 inch coffee tables need to be ordered by phone. With broad log legs and a solid wood table top, this coffee table is fit for a bear. This twig-legged Bearwood End Table is a solid match for the Bearwood Coffee Table and perfect for a bear's friend. Pictured in Hickory with Natural finish. Whether you are looking for a shaker style coffee table or a mission style side table, Amish Furniture Factory has a wide selection of pieces to fit your unique style.